As anyone who has been reading my blog for a while would know, my decluttering style is usually slow, steady and haphazard. That is, I declutter random items from all over the house, rarely concentrating on one particular area. This method, however, doesn’t necessarily appeal to everyone of course. If that is the case for you then it is best to concentrate on one area at a time or the task would probably drive you crazy. With that being said here is a strategy to use when decluttering space by space. If the idea of letting go of things disturbs you but the annoyance of keeping them is equally disturbing, perhaps it is time to adopt a new focus. Instead of looking at each item, look at the space itself and decide what it will take to master it. What or how much do you need to let go of in order to feel comfortable and happy with and in that space. Sit in the room and imagine the serenity of having this area of your home uncluttered, easy to take care of and only containing items you use and/or enjoy. With the joyous thought of how good it would feel to achieve such a goal, start choosing the items you care the lease about or have the least use for, and start removing them. Sort them into your sell or giveaway boxes and trash or recycle the rubbish items. All the while keeping your focus on mastering your space rather than succumbing to the temptation of keeping items for insubstantial sentimental reasons. Remembering all the while that YOU ARE NOT YOUR STUFF. If you only keep the most loved items or/and the most useful items the result will be the best of both worlds. That is, a serene room with just enough items to keep it practical, functional and/or beautiful. One 365ers example of mastering her space. Declutter one bookshelf. Not the whole bookcase, just one shelf. Don’t pander to older children by driving them here there and everywhere. The exercise will do them good to walk, ride or take a bus when and where appropriate. I am sure the fuel savings will be quickly noticed and they will grow more independent for it. Holy cow – what a transformation and I love the pictures! Exactly Michelle and can you imagine how much more calm and relaxed the reader now feels living in that space. I use a combination of approaches as most do, working my way from totally useless junk through harder and harder decisions as the layers strip away. My focus right now is hanging clothes. My goal is to have everything hanging loosely and not jammed, so if you were to grab something the hanger would fall back into place and not get tangled up. Still a way to go there but I’m liberating some more pieces today. There’s a joke that when you hit a certain age, someone comes in and steal your body parts and substitutes someone else’s. I have sadly discovered this to be true of my hips. Even if I DO manage to lose my extra ten pounds, my cherished black suit with the slim skirt won’t fit the proportions I now have. To the thrift store today. Hi Wendy, at least three years. I started 3 years, 3 months and 11 days ago. I started blogging about it 3 years and just over a month ago. And wow what a milestone year this one is turning out to be. I am excited to see how it finishes up. What age is it the the body parts change, I will try to be vigilant about that. I will be turning 50 within the next two years and so far I am doing OK. The beauty of the thrift store is you can drop off the items that don’t fit and pick yourself up to guilt free inexpensive replacements while you are there. I am quite happy with the size of my clothing collection but I do like to swap the odd things out occasionally and my thrift store is perfect for that. Ha ha Michelle, sometimes the life changing part sneaks up on you without you realising it. Then suddenly you think, Holy cow, who is this tidy, organised and decluttered person and why am I finding it easier to stick to my budget. Wendy B – it was a year ago that Dizzy and I embarked on Project 333 and I’m still on it – I actually have way less that 33 items but that is because I’m enduring to the end of the longest, hottest summer in NZ’s history. I suggested to Andreia recently (she was also working on her wardrobe) that if 33 sounds extreme, pick another number and go with that. The Project 333 police won’t appear on your front door step and demand to do an inventory. Put all your ‘maybes’ in a suitcase and put them away. If there is a crisis you can always get them back out. By the end of the season you will probably have a different perspective on what you actually want in your wardrobe. Wendy B – I know what you mean, but I recently had to get rid of a lot of clothing and it was liberating. Of course, now I have not a lot of clothes (but that was my choice not to spend up before Autumn) but it was still a great moment. My youngest daughter hates clothes shopping so I’m familiar with how you feel. When they were little her older sister used to try on stuff for her, but that didn’t work any more once they hit the teens. My other daughter is quite clever with clothes and worked out for her sister what exactly she needed to have a functioning wardrobe covering the basics and a few feature pieces, but making sure that more dressy situations were covered, and so we’ve stuck that ‘recipe’ for Courtney and it seems to be working well. We look online first and then narrow down what shops we will go into. This is a great idea for Courtney, Moni. I am going to try doing that kind of thing once I have all my weight off. OMG REALLY WHAT THE!!! Time flies when ya is de-cluttering with y’all!!!! Sorry been watching Jeff Dunhams’ Bubba J hahahaha. I have let a few more go to the Salvo’s and now with season switch approaching I dare say there will be a few more. If I don’t use it this Winter out it goes!!! Another tactic that I saw on a blog is to completely empty a room – either physically or in your mind’s eye as you look around – and think about what you would choose to put back if you could really really choose. Rather than things having ended up in rooms for all sorts of reasons as you have gone along. Really focuses the mind! Hi L Jayne. This strategy to me is best left until the bulk of the decluttering is done. Especially when people are finding it difficult to get their head around the idea of letting things go in the first place. I have to admit this is the method I have deliberately avoided. Too much mess, too much disruption, too much decision having to be made all at once. I am sure it would be the perfect method for some thought. But if you do it in your mind’s eye, as L Jayne suggested, it can be just as effective without all the mess. I’ve used this mental picture to keep me motivated, when the piece-by-piece seems too slow or too hard. It lets me think about the reason I’m decluttering, and makes it easier to decide on the harder items. I agree the minds eye is a less messy way to approach this. The basis behind the Master Your Space strategy is to visualise in your minds eye what you want the area to look like. It is only the plan of attack that changes. A bit scattered tonight, I am … thank goodness it’s almost the end of the week, haha! I feel the same Jo H. I have had a visitor all week which spreads my time even thinner than usual and I am going away for the next two weeks visiting family. I haven’t got my blog aligned for the time I am away so things could get interesting so please wish me luck. I might see if my mum and MIL will allow me to declutter an area in their homes and then post about it. I am sure they won’t mind the decluttering bit but they might not like the clutter aired on the internet. We’ll see. Good luck for sure, Colleen … I’m pretty sure I wouldn’t want my clutter out there for the world to see, unless maybe it was a single drawer of non-intimate items like kitchenware or sweaters! 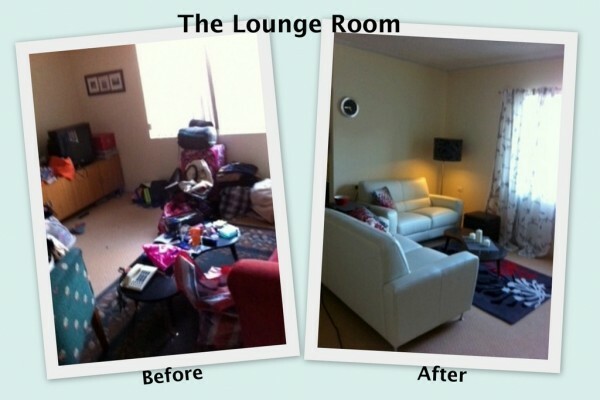 That is quite a transformation from the before picture, I wouldn’t have known it was the same room. When I first knew I had to change something I knew I wanted my home to feel like a sanctuary, or a vacation home. That was my starting vision. That meant I didn’t want a lot of electronic stuff filling up space as the first step. It just snowballed from there. Hi Lois, your situation is a perfect example of how this strategy works. Well done you. Clearly your focus remained on the vision and not on being emotional about the things you were letting go. I used this method with my craft room once I had slowly removed the bulk of the clutter. In fact as my goal for that area continues to envision it taking up less and less space. This goal certainly helps me become more and more ruthless about letting stuff go. I did that technique with my mom in order to declutter and organize the living room. I asked her what furniture she wanted to keep in the living room and how she would like it arranged. It allowed us to figure out what to do with the pieces she didn’t want in the space anymore. Some of the items were donated (to family members and a local thrift store) and a couple of pieces were shifted into the office – that’s where she’d been wanting those pieces to begin with but the office is only recently set up in a way to make it feasible. You are doing a great job decluttering and organising with your mother. Well done. In the end some things do get shuffled around the house. I moved what I wanted to keep out of my china cabinet to my kitchen cupboards so I could declutter the cabinet. I was glad to see the back of that big bulky piece of furniture that made the room feel like it was closing in on us. China cabinets can overwhelm a room! I don’t blame you for being glad to see yours leave the house. Rachel W – I have lost count of the amount of furniture that has left the house, am sooooo glad too! Rachel W – I don’t know if I’m getting my Rachels mixed up – but are you the Rachel whose mum was quite resistant to your efforts last year? If so, well done, it sounds like you have made big progress! As I’ve been decluttering, the standards for our living / dining room keep going up. First it was just that I didn’t want piles of mail and folded laundry there. Then I got rid of some things. Then I cleared off surfaces. Lately I’ve been finding proper homes for the things that hang out in the living room but don’t need to. All sorts of things that didn’t seem cluttery to me before have started to stand out to me. Those higher standards are more slowly percolating into our office. Good for you Rebecca J, and that is why the slow and steady pace works so well. You adjust to a higher standard as you go along and letting go of things just becomes a natural progression not a struggle. Trying to do too much at once is often much harder to deal with both physically and mentally. Great pictures. Looks like they are different rooms not the one room just made nice. I love that feeling of clean and decluttered. As much as we have decluttered the craft room I still have a goal in mind that will make it have even less furniture. A lovely flash back to see my photos on line. I have taken a minimalist approach to decorating all my room – except the balcony which is full of lovely plants!!!! Hi Archie’s Girl, I was hoping you would still be reading and notice them. You certainly mastered your spaces and how wonderful they all looked in the photos you sent me. You can see them all the time on my Before & After page that you will find through the Guides tab at the top of the home page of the blog. Hey Archie’s Girl – this is your place? Wow what a transformation!!!!! You must be very proud of yourself! I also declutter haphazardly. There may be an item that has been bugging me for quite a while and, finally, I just say “good bye” and off it goes into the donate box. And speaking of clothing — I had a green “party” dress hanging in a garment bag in my closet (with satin shoes to match, thank you) that I have not worn in probably 15 years. Even though it has been out of sight, it has been bugging me — nagging at me. So, a few days ago, I got it out, tried it on (it still fits), but I couldn’t believe how ridiculous I looked in it. Yuck!! I couldn’t believe that I ever wore it! “Good bye” — into the donate box — dress and shoes!! Mary Ellen – I know what you mean about “bugging me” – its like they’re taunting you saying that we can’t get rid of them as if they hold all the power. Good for you. I recently sold MY green party dress and MY matching green satin shoes are on trademe. No regrets, why didn’t I do it earlier! Great post today, Colleen. Visualizing how I want a room to look helps me some, but more than that, I want to visualize that everything that is left in a room has a definite purpose or beauty. Usefulness holds a higher priority, and certainly less is more when it comes to items that are beautiful, in my opinion. The other prominent factor is ease of cleaning. I really desire to have a home that takes no time to tidy up. A proper and thorough cleaning would take a longer time, but I would like to have a home that is easy to keep tidy, which leaves time for more important things, and so that anyone is always welcome at any time. It is not too bad now and takes much less time than in the past to tidy up, especially the living room and kitchen. I definitely do not go into a panic mode, like I used to,when people drop in out of the blue. That is a great feeling, but I do know that there is more work that can be done and I will keep steadily working towards simplifying even more. I love the before and after photos, they are so encouraging. I like your thinking Jen because ease of cleaning is a big thing where I am concerned too. Not only is it easier to pick up but also easier to actually vac, mop, dust etc if there is less stuff, less useless furniture and the floor is easy to get at. Jen & Colleen, this is exactly why I like decluttering. The less you have the less to clean and clean around. I”m a neat freak and it drives me nuts to have to dust around all the doo dads and stuff too. I find I have to mix up my tactics – just to keep fooling myself – I have used the slightly more extreme ‘space’ method (although I call it the Hurrican method) and just pull everything to pieces and it will cause me a very stressful couple of days but it gets done in a hurry because I just can’t bear to live like that (ironically I used to live pretty much like that all the time). I usually only do this when it is a piece of furniture that has been housing stuff and progress has trickled off and a time deadline is approaching – but boy it stresses me out. I don’t generally recommend this method unless all else fails. Sometimes we just have to claim back space, it is our home afterall! But we continue to have these skirmishes with clutter and stuff – why? We are fighting with our subconscious on some level. The ornament of a cat doesn’t care if it sits on my windowsil or sits in a box or gets donated to goodwill. Our homes should reflect who we are in the NOW, not with an assortment of bygone eras and long past obligations. It tries to makes hold on to stuff we are not even using and probably never will. Andreia – LOL – its funny that you say a conqueroring general because I was going to say a 4 Star General but what war, what battle and did they win it? Yes conqueroring general covers it. Yes my desk at home needs some attention……again. Andreia and Moni, I think desks are always a problem. Since I am getting so forgetful that I could hide my own Easter eggs, I tend to leave something I’m working on out where I can see it. Otherwise I may forget it. I’m still trying to find the best way to deal with this. I do at least try to put it all in one small pile and not spread out all over. I handle mail as it comes in and if it is a bill then it goes in a certain file to be handled once a month with all the bills. So the mail is not an issue it’s all the other stuff. For all I have tried to get everything online as much as I can there is still a lot of paperwork that comes in. Medicare refuses to the Explanation of Benefits online and most doctors still insist on sending paper bills. I’m glad that at least we have gone from needing 2-3 file drawers to only one. Anyone who figures out this problem – please share with the rest of us! I’m with Deb J, I need things to be visible or I forget about them. Even if I make a pile, only the top item will catch my attention. I have nearly a dozen post-it notes on the front of the kitchen cupboard because I will forget the items they represent if I put them away. Help! It is funny that you call this a war on your stuff. Even though I probably mention those sorts of comparisons myself at time I really don’t feel like my experience has been a war. This gradual approach and focusing on small goals has made the task seem relatively simple for the most part. I dare say I have had my challenges but when I look back I just think how easy that was compared to what I thought it was going to be. Colleen – not so much a war, but I do feel like a conquering hero sometimes when I see the results. Your comment here about ‘hurricane’ made me laugh. I love to watch, ‘How Clean is your House and spend an hour screaming at the telly with my friend and laughing when the people are in total denial. They step over and around everything because they are so used to it being there. Not that I think that is you, by the way, just your comment that you stepped around stuff hahaha. I dare say we all did a little sidestepping at some stage. Dizzy are you out there? Allowing our stuff to control us is how we got into a position where we need to declutter. So yes, I agree, taking control back of your stuff and your space is so important. I’m a haphazard declutterer too, though there’s not THAT much left to declutter. I might get rid of a green bag full of stuff once a month these days (so sadly, no longer get that lovely declutterer’s high!) I did just ask the children to get rid of 10 books each from their collections. They managed 9 and 7 respectively, which wasn’t a bad effort. I do this each school holiday so that balances out their Christmas gift books, and any others that i buy them through the year. Just went through my daughter’s room – again – and culled a heap of stuff and am happy to say that FINALLY she’s managing to keep it tidy for more than a day!! Hi Loretta, good to hear from you. I am glad to say my decluttering is mostly done too. I am excited to get on with the final push once Bridget’s stuff and the stuff I am giving her is out of here. That may in fact be the final push. This is advanced decluttering for sure. I’m only able to do that for very tiny spaces (like this week’s mini mission spaces). There are some rare enlighted moments, when I’m able to think big, but mostly, I think really small and focus on little things. Plus, my visions won’t come true completely anyway. They don’t include a desk with two computer screens for example (in fact I loathe that corner of our living room! ), but as long as I want to keep my spouse I will have to live with that. Hi Sanna, when I say master your space it really doesn’t matter how small the space is. So if you can only imagine one little space at a time then so be it and go for it. All the little spaces add up to one big one in the end. I just completed my mini mission! I had to giggle at the recap of the day’s mini mission- Declutter one bookshelf. Not the whole bookcase, just one shelf. lol. I’m happy to report I am done with the whole bookcase since I did break it down into a few shelves a day this week. 🙂 Normally I don’t mind a haphazzard approach to decluttering and moving to and fro typically suits me just fine, but this week I just really wanted the entire case dealt with. I’d been haphazzardly removing things one at a time from this bookcase for awhile and all the low hanging fruit was gone, but it still had way too much that didn’t belong on it. It was really just time to go through it in a concentrated manner. Now that all ten shelves are dealt with my goal for tomorrow is to start going through the small decorative boxes (there’s 5 of them) that sit on the very top of the bookcase. Each one of the five is organized, but I know there’s things in each one that aren’t being used and can be decluttered. 🙂 There’s a still a few items on the shelf that belong on the shelf but need to be gone through in a thorough manner by themselves (my recipe box, one folder and a few binders), but at least the case as a whole only contains what it should now. Those other projects will be started another day! 🙂 It looks much much better and I feel accomplished having tackled that rather large chore. Thanks for giving me the inspiration to break it down into small pieces and getting it done this week! (Even though it wasn’t technically this week’s mini mission. lol). Way to go Melissa. Woo Hoo!! 🙂 Thank you. I appreciate the cheering. It can be tedious work sometimes, but it’s so worth it to have a calmer space. I know I’ll be glad I did all that work this time next year (which is when we’re hoping to be moving)! It should take a heck of a lot less boxes this time than 4 years ago when my husband and I moved into our condo. We have a lot less furniture now which will make moving a lot easier too! Oh how great it will be to only unpack one toaster this time! lol. We combined our households for the first time and had doubles or triples (or more) of just about every household item there is. Not anymore! 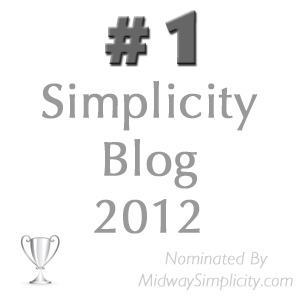 I very much appreciate the boost in motivation that this blog gives me! I have been needing the moral support of this group during the last few days but did not have time to write. I have been trying to imagine less stuff to store so that has made me brutal in my keepsakes i.e. things that we saddle our kids with down the line. Now, I hope I don’t shock anybody but I have had to make some hard decisions in order to let go. It has been emotionally charged as I looked at baby books, scrapbooks, tons of photos, all sorts of memorabilia and had to decide final destinations for it all. I even sold my doll collection on ebay (did not get much…but it is finally gone! None of my children were faintly interested in it). But as I saw empty boxes piling up that was so wonderfully motivating. I scanned hundreds of photos but kept literally a hand full. It was SO hard. But as I sit here writing this, on the other side of that, it feels so good. I had to keep visualizing what it would be like to not have so much in storage. It was what helped me get through this. Although I am not totally done but I have made a decent start. I also want to visualize the looks of the faces of my children when they “inherit” all this someday. Will they be happy for the few well-chosen pictures and items from our family history or will they feel overwhelmed. I am shooting for the first one. That sounds like some tricky and emotionally charged decluttering. I am glad you came through it relatively unscathed. I am sure your children will be grateful not to have to sort through boxes and boxes of stuff when the time comes. I still need to go through my keepsakes again and send off with the kids everything that was kept for them. If they don’t want these things they can do what they like with them. Good for you! This sounds like it was no small project. I wish my mom and dad would pare down their belongings. They have quite the inventory! As I continue on the declutter journey, it’s a motivation booster to read and see photos of how others are able to improve their homes. Kudos to the person who submitted before and after pic. Great job!